Apply the product twice daily directly to the relevant area. The product starts working after just a couple of applications. MESO PIGMENT REDUCE is the most intensive, effective and innovative treatment for hyperpigmentation, melisma, sun damage, age spots, discolouration and dark circles. The product helps reduce and prevent patches on the skin, face, body and hands. MESO PIGMENT REDUCE’s formula is rich in active ingredients and contains high concentrations and powerful depigmentation properties. These form a contrast to the phenomenon, both of a biological and chemical-physical nature, which lies at the root of these skin imperfections. The skin’s complexion is the result of the presence of various pigments. Haemoglobin in the red blood cells and carotene found mainly in the adipocytes. The pigment that most affects the skin’s complexion is melanin, which is produced by specialised cells in the epidermis called melanocytes. Melanin regulates the skin’s complexion via a complex mechanism. A sickly complexion is caused by changes in the skin’s colour from too much melanin or, in some cases, deposits of other pigments in the epidermis. This change may occur on specific areas of the body or may be more widespread. 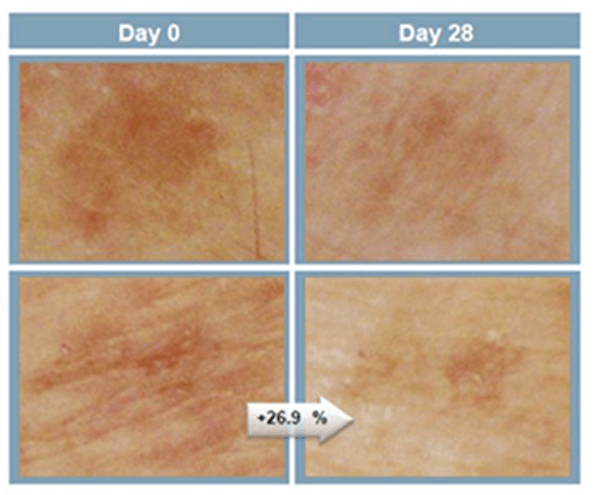 Discolouration or patches on the skin are not all the same. Each one has a different origin and depth. What are the key ingredients in MESO PIGMENT REDUCE? Glabridin: An isoflavanoid extracted and isolated from the Glycyrrhiza glabra root. In vitro and in vivo studies have show that this phytoestrogen contains a number of properties: Antioxidant, anti-inflammatory, neuroprotective, antiteratogenic, antibacterial and depigmenting when applied to the skin. The depigmentation activity of the glabridin is caused by a multifunctional effect on the causes that lead to the manifestation of a sick complexion. Vitamin C: Ascorbic acid, an almost ubiquitous molecule of nature, is present in many citrus fruits and leafy greens and reduces melanin production as it is able to reduce o-DOPAchinon to its previous state, DOPA, which disrupts the oxidisation process that leads to the formation of melanin. This proves to be more stable in relation to oxidisation and thereby improves the product’s effect. Arbutin: A natural glucoside of Hydroquinone, chemically known as Hydroquinone-β-D-Glucopiranoside. However, the mechanism of action appears to be different; clinical studies on the cultivation of human melanocytes have opened up the possibility that it does not react to a synthesis or enzyme expression. Clinical studies have confirmed that its application does not cause side effects, unlike hydroquinones. Azelaic acid: The bleaching properties of azelaic acid are due to the effect of the competitive tyrosine-inhibiting effect. Niacinamide: The biologically active amid of vitamin B3. Studies have shown that niacinamide combined with suitable sun protection can provide better lucidity compared with the use of sun protection on its own. Vitamin A: A retinoic acid that also acts as depigmenting and can give a luminous effect when applied to the skin. However, the mechanism of action, which has not been fully clarified, is on the one side associated with increased cell replacement of keratinocytes, thus facilitating pigment loss from the epidermis. On the other, it indirectly enhances the cytotoxic effect on melanocytes in some skin pigmentations by inhibiting the routes of discharge (with a relative increase in toxic substances such as quinones). Kudzu: The root and flower, which is used in traditional medicine, has various medical properties. Numerous studies show the activity of this plant extract in relation to melanogenese. The activity in relation to suppressing the melanogenese is confirmed visually by colour of the fontana-masson. Brassica Napus Seed Extract: Rich in antioxidants. In vitro and in vivo studies have shown that the active ingredient is able to react to signs of ageing, reduce discolouration of the skin and ensure an even complexion.